Here is a photo I took on September 24th, 2010 while at Hell Survivors Tippmann Challenge Game with Thad “Weltman” Drum. 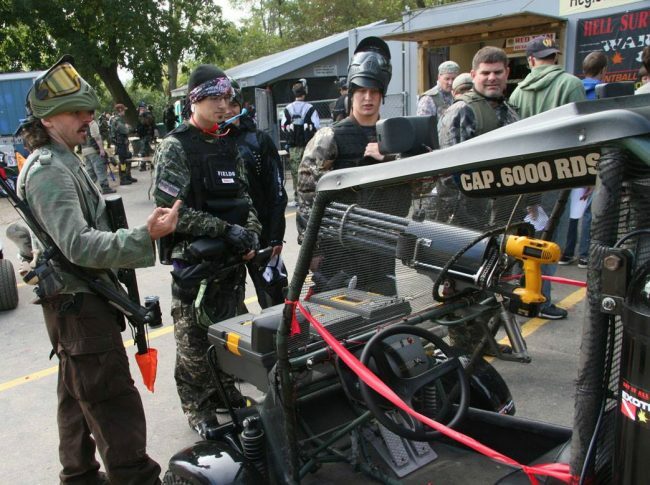 This photo shows Tippmann’s Minigun on the Hellhound. I’ll post some zoom in photos over tomorrow or the next day but I didn’t take many photos of it unfortunately. Tippmann’s Hellhound at the Tippmann World Challenge Event. Looks chain driven but doesn’t really offer much of a view on the operation. The side of the minigun has a Cyclone feed looking tube but I’m not sure if it was actually fed that way? History on the Tippmann's 68 Special conversion which changed a majority of the model SMG 60 and SMG 68s into Direct Feed Semi Automatic paintguns. Coverage of an early Speedball tournament at SC Village and a tournament at Splattball city in Detroit are covered in the March 1990 issue of Paintcheck.